Note: This tutorial was originally written for KIT-13320 but applies to the KIT-14684. The only differences are the included buttons and thickness of the resistor leads that are included in the kit. Overall, they are functionally the same. The SparkFun Inventor's Kit for Photon, also known as the SIK for Photon, is the latest and greatest in Internet of Things kits. 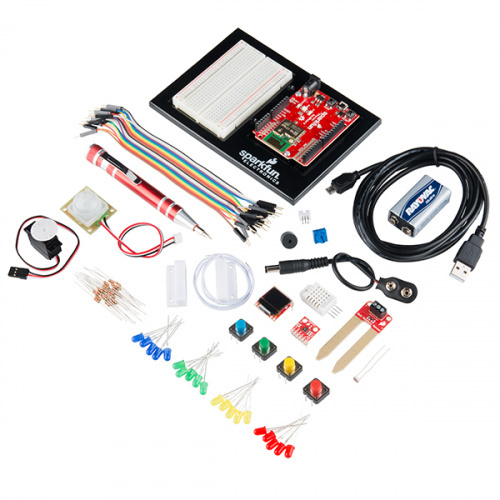 Whether you're a software developer just getting in to hardware, an electronics engineer learning software, or somewhere in between, this kit will help you get your projects hooked up to the Internet in no time. For an overview of the Photon RedBoard and a preview of the kinds of experiments you'll get to build with this kit, check out the video below. Set Aside Some Time - Each experiment in this kit has two parts, with the second half usually containing an Internet-connected component. Please allow yourself ample time to complete each experiment. You may not get through all the experiments in one sitting. Please understand that the second half of each experiment is bonus material and relies on outside services, websites and technologies, to which some of you may not have access. Here is a complete list of all the parts included in the SIK for Photon. If, at any time, you are unsure which part a particular experiment is asking for, reference this section. The following links are here to help guide you in your journey through the SIK for the Photon. Referencing these documents throughout this guide will help you get the most out of this kit. The Photon RedBoard Hookup Guide - This guide goes over the features of the Photon RedBoard in great detail, from the functions of each pin to a compare and contrast between the Photon RedBoard, the Photon, and the classic Arduino Uno. Photon Development Guide - Learn how to develop with your Photon or Photon RedBoard using the three different methods described in this tutorial. Getting Started with Particle - The Particle website has tons of great documentation to get you started in the world of IoT development. Each experiment will also have a Suggested Reading section to aid you in understanding the components and concepts used in that particular experiment.